I have always been a Claussen Kosher Dill Pickle fan. Forever. I don’t like sweet pickles or bread and butter pickles, they just aren’t my thing. Claussen just tastes better, in my opinion, I don’t even like the shelf brand dill pickles. They are either too sweet or too tangy. That’s why I posted this Claussen pickle recipe several years ago. 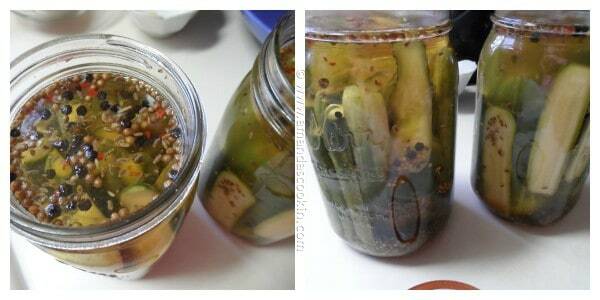 Refrigerator pickles are a lot easier to make because they don’t require using the traditional canning process. That also means they can’t be stored on a shelf in the basement or in the pantry, they must live in the refrigerator. Last year I made some pickles with the canning method and the recipe that I used had a very high vinegar to water ratio. 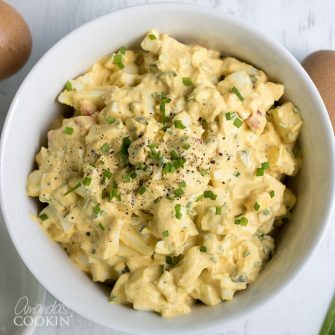 So they were far too vinegary for me to eat straight from the jar, which is one of my favorite things, though they were great on burgers and in potato salad! So I started my search for a Claussen copycat. I found this one but it used apple cider vinegar. I as concerned that would create a sweet pickle, which I don’t like, even though the author of that recipe is just like me. Yuk to sweet pickles! So I looked at the actual Claussen ingredient label and it said they used distilled white vinegar. Some of the ingredients were different too, so I decided to use the recipe that I found as a jumping off point and created my own version. The verdict? Everyone in this house loves them! They aren’t exactly like Claussen, but pretty dang close! Close enough that they get devoured by everyone in this house. They are actually fun for me to make. So while it would certainly be easier for me to grab a jar of Claussen from the grocery store, and I probably still will now and then, I love making my own. You’ll make the brine first, it’s easiest to do it in a 2-quart pitcher. You’ll see me mixing the brine in a bowl in the picture above. Don’t, it’s an extra step, just use a pitcher. Put the dill seed and dried garlic in the jars. 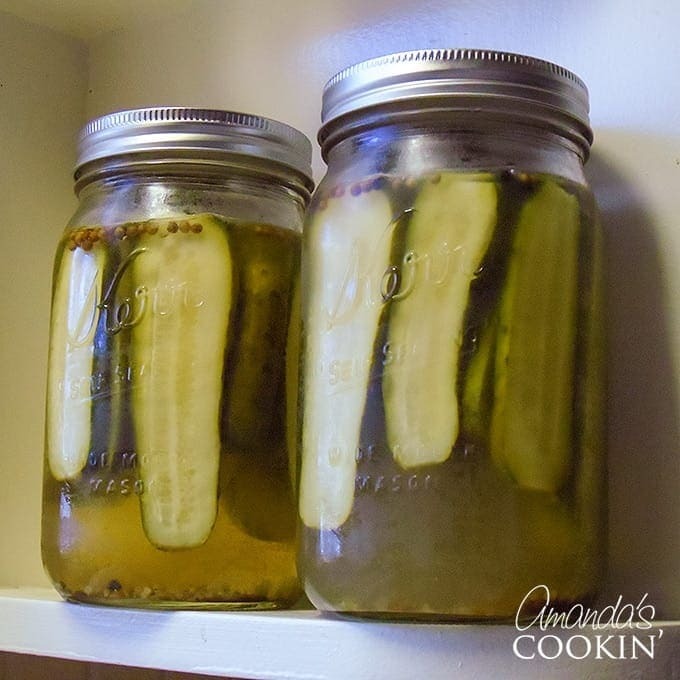 Now, make sure you give your pickling cucumbers a good rinse, make sure there’s no dirt. Trim the blossom end, I trim both ends, then cut in half lengthwise and distribute in your jars. Before adding your brine, strain out the solids. Distribute the solids evenly among the two jars, then add brine. You will have leftover brine that can be discarded when you are all done. This is what they will look like after a day or so. They usually take 2-4 days. My first batch took the full four days while my second batch was ready in two and a half days. I think the difference was that I actually used three jars and they weren’t packed as tightly. Scum or film on top – During your first few days, fermentation takes place. You will probably see bubbles rising to the surface and may see some “scum” forming on the surface. Skim this off and discard. This is a completely normal step in the fermentation process. You can download the complete PDF document from The Colorado State University here. The blossom end of the cucumber (the end opposite from the stem) contains an enzyme that can make your pickles turn mushy. Always cut it off, I cut off both ends for good measure and to keep them uniform. Use vinegar that has at least 5% acidity. Don’t reduce the vinegar in this recipe. Only use pickling salt or Kosher salt, though I always use pickling salt. Table salt contains an anti-caking agent that causes the brine to get cloudy. If you use table salt, it’s still safe, but you will have a cloudy jar of pickles with white sediment at the bottom. Use cucumbers that are of the knobby variety, grown specifically for pickling. Check seed catalogs to find the different varieties. Cucumbers with a wax coating are not recommended as the brine will not be able to penetrate them. When selecting cucumbers, be sure that they are firm and not soft. It’s tempting to reach in and turn your cucumbers, but please make sure you wash your hands first. Introducing any foreign oil or material from your skin could cause problems with your brine. When your pickles are all gone, do you pour the pickle juice down the drain? Instead, try these ideas for reusing pickle juice! Looking for a unique recipe to try with your freshly make pickles? Here’s a Grilled Tomato Relish that’s great on burgers and dogs! 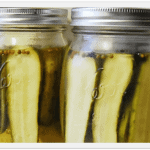 Learn to easily make homemade Claussen pickles! This Claussen pickle recipe is a copycat of course, but it's hard to tell the difference, they are so good! To make the brine, combine water and vinegar in a large pitcher. Add salt, coriander seed, mustard seed, red pepper flakes and black peppercorns. Stir until salt is dissolved. Set aside. Wash cucumbers in water and trim 1/8-inch off of the blossom end of each one. Slice each cucumber in half lengthwise. Divide the dill seed and dried garlic evenly between two clean quart sized jars. Fill jars with cucumber halves, fitting as many in as you can, they may be snug! Stir brine again to mix ingredients. Place a fine mesh colander over a large bowl or measuring cup. Pour brine through the colander, catching the brine solids in the colander. DO NOT discard! NOTE: You will not be able to fit all the water in this measuring cup or in the two jars. The goal here is to save the brine solids and use them, you will be discarding the left over vinegar and water mixture when finished. Once all the solids have been removed from the brine, distribute them evenly among the jars. 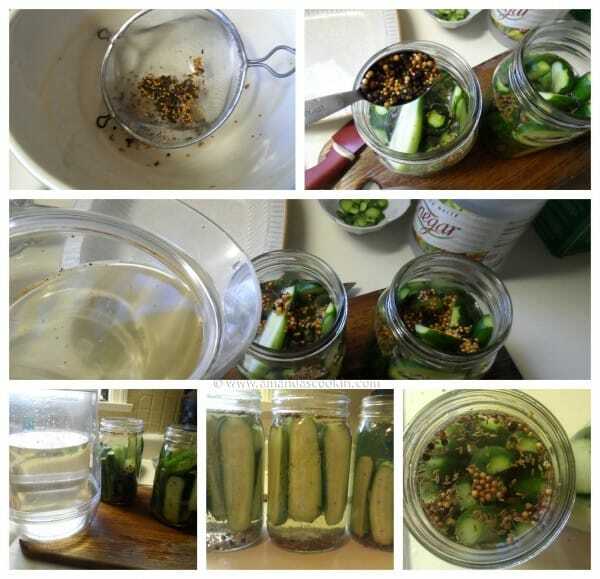 Using the brine liquid in the measuring cup, pour into the jars until all the cucumbers are covered. 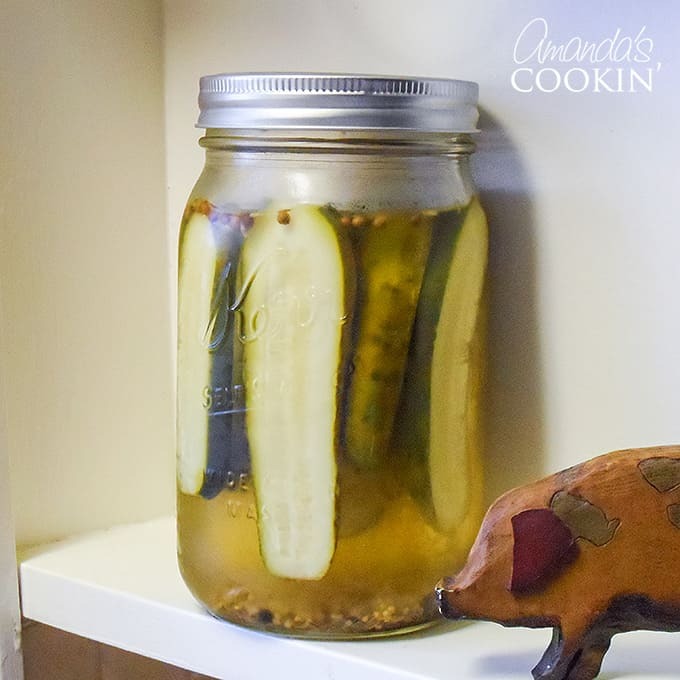 Your brine level should cover your cucumbers and reach the bottom of the jar neck where the twisting begins. The cucumbers will also release some liquid as they brine, so don't overfill the jar. Discard any remaining brine liquid. Cover lightly with a lid perched on top but do not close and seal. Leave on the counter (out of direct sunlight) for 2-4 days, or until the cucumbers taste like pickles throughout. Secure lids on jars and refrigerate for up to six months. I made these, but after nearly two months in the refrigerator, they just taste like cucumbers (I despise the taste of cucumber). I came back here to revisit and see if I did anything wrong… Sure enough, I missed the part about leaving them on the counter for a couple of days, I put them in the jar an right in the fridge they went. I tried a sip of my brine, it has become flavorless except for the cucumber taste. I put so much work into them, and they’re completely ruined. Is there anything I can do to save them? I feel like if I stuck them on the counter at this point, they would just turn to mush. Sorry to hear that! 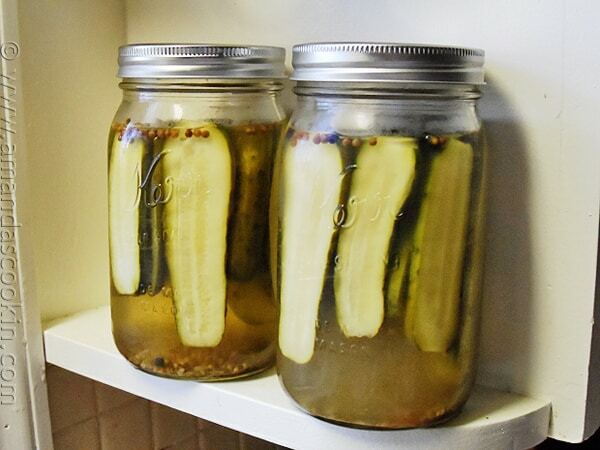 I would try making the brine again and putting the pickles into the new brine in the fridge. Not sure if it will work since the cucumbers have already soaked up the previous brine, but worth a try. What if I wanted to use whole cucumbers, and not cut them in half? do you think they would still only take 4 days on the counter or longer, would that be even safe to leave the out for longer than 4 days? I thought I’d try to make my own pickles because I didn’t care for those I could buy: they were all too sour, too vinegary. I thought I’d make some using less vinegar, but somewhere in this recipe you say not to use less vinegar. For taste? or because the brine will lose its pickling ability with less vinegar? This is the same reason that I sought out a recipe myself as well. I didn’t like how strong many of the recipes out there are. 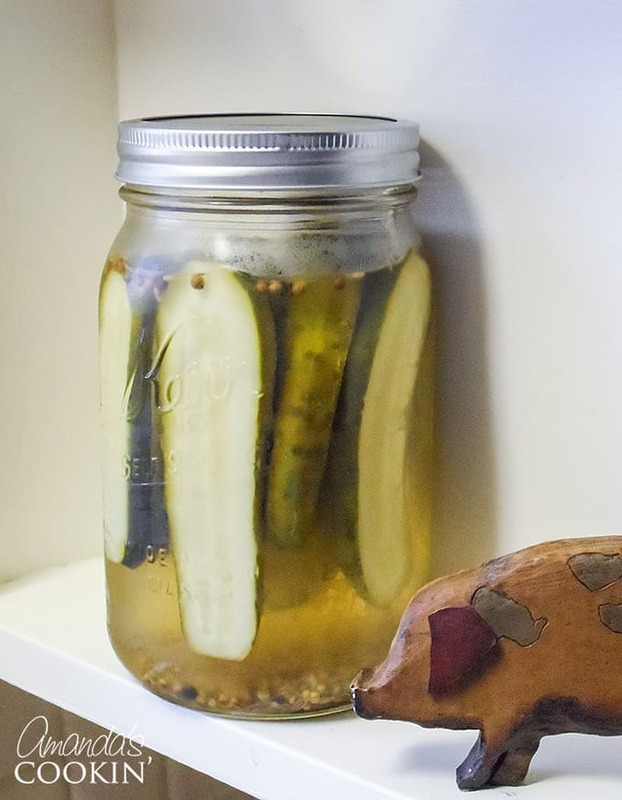 If your cukes are ok in the fridge for a few days, I would suggest making the brine as directed and trying it with a few cucumbers in a small jar. Then taste test and see if it’s to your liking. The flavor profile will change after the first few days as well, but you’ll get the general idea. I made these on Saturday and they were delicious even before they “pickled”. The brine was perfect. I was so excited for them. Went to check on them today, (3 days later) and every jar had a thin layer of white mold on them. ?. I know I followed the recipe perfectly. The vinegar was 5% and they some how got mold?? I was so upset!! Is there anything I can do? What happened?? Hi, Amanda. 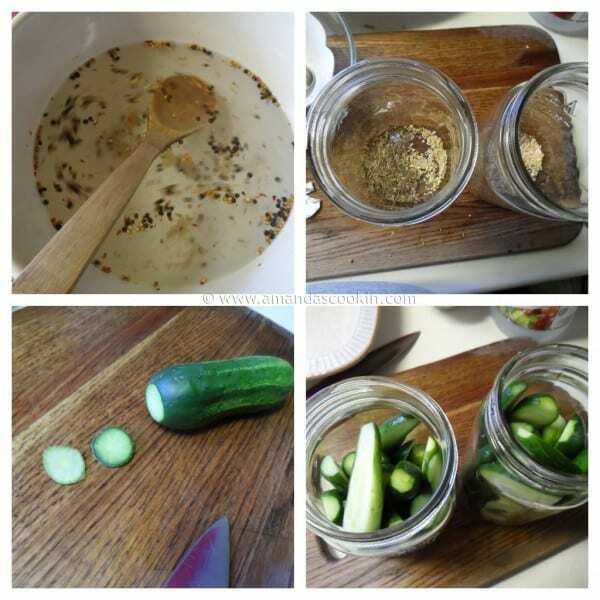 I made this recipe, and the pickles tasted great but came out completely mushy and inedible. Possible that the cukes were old? They were still pretty firm, but had been around for a bit waiting for more to come out of my garden – so that I’d have enough to make a couple of jars. Also, would it be possible to use the leftover brine to make more? I just feel sort of bad about throwing all that leftover brine out. Could you just use the rest and add more spices to make a few more jars? Thanks. Ho Melody, sorry about your pickles being mushy! :( Not sure if it were the cucumbers. I usually keep mine in the fridge before making them, so not sure if that’s what happened.As for using the brine again, I probably wouldn’t. But you COULD try it – I just feel like it might not be as strong the second time around. Can these be canned also, or are they strictly fridge pickles. Ive been looking for a good clausen recipe but it seems they are all fridfe ones. Your reviews keep me coming back to yours but I really wanted to can them as I don’t have enough room in my fridge for the tons of cucumbers coming out of my garden. I am sure you could can them, but this recipe is meant for the fridge. I don’t know anything about canning, so I’m not comfortable giving you advice on this. I DO know that they won’t be as crunchy if they are processed because that involves heating them up. Hi Amanda, I was wondering, most of the Claussen recipes I see on the Internet use a boiled brine! Your recipe does not, right? How is it different since both methods seem to have the same result of storing them 6 month in the fridge! Looking forward to your reply! Thank you for your reply.Yes they boil the brine and then let them stand for two days or so before storing them in the fridge! Anyway I use your cold pack recipe, had to keep them submerged . After two days they were perfect and ready for consumption! Delish!! Awesome so glad you loved them! My fiance and I have made this recipe twice now, with great success. To those who aren’t SEEING the fermentation, don’t fret – just follow the instructions to the letter and you’ll be fine. Modifications I’ve found useful: minced garlic and dried onion flakes, though my jars have been getting a SMIDGE cloudy (no problem with taste) so I think that the dried onion flakes may have an anti-caking agent. Question, Amanda: our recent pickling cucumbers and slicing cucumbers (which we are going to attempt – not waxed, from our garden) are SO big that instead of spears, we want to try slices, perhaps 1/4 to 1/3 inch thick. Do you think that might work? I followed the instructions and the pickles have been sitting in the refrigerator for a couple of days but they taste flat. Is there anything I can do to get more of a vinegary, saltier flavor like a true Claussen? Hi Alan! It usually takes longer than a couple of days for the flavor to really kick in. Sorry I’m just now seeing this! Were making these this week!!!! I’m so excited!!!!! Were gonna use mccormick pickling spice and fresh garlic though!!! Will let you know how turns out. I am a pickle lover, eating pickles and drinking juice!!! I will sit and eat a whole jar….so i hope this recipe will make me happier than happy!!!!! ??? Can I half everything for smaller batch and be fine? So I hate throwing anything away. If I want to make 4 quarts, using the same amount of water, should I double the spices? Yes that should work fine! What happens if you dont see any fermentation? I’m on day 2, but not seeing any so far.. I followed the recipe. Does this mean my pickles will be bad? They should be fine! Just keep following the instructions and refrigerate when it says to. Let me know how they turn out! Quick question, most of the recipes similar to yours has a full 2 cups vinegar. I want to try yours but wanted to double check to make sure that isn’t a typo? I dont want to feed my family something that will make them sick. When fermenting I know the salt and vinager ratio needs to be high so it doesn’t spoil or grow dangerous mold of some such. The measurements are correct :) I’ve made these multiple times and they are always great!